Fundamentally blackjack comes down to whether you ‘hit’ or ‘stand’. Of course there have been big winners who have had that lucky night when they flew in the face of the odds and made some amazing hands. But these are the players who nine times out of 10 will walk away having blown their bankroll. Blackjack players can maximise their chances by following some simple strategy when playing. This article will explain the simple blackjack table and teach you how the odds directly affect your long term bottom line in gambling. What does ‘hit’ & ‘stand’ mean when playing blackjack? The aim of the game in blackjack is to get as close to or get 21 without going over it. When it’s your turn you have the option to hit. For instance the dealer has just dealt you a five and a nine and then hit a King. You would always ‘hit’ and get dealt another card in this situation in an attempt to get closer to 21. To ‘stand’ in blackjack is to say no to any more cards being dealt to you. This means you are confident that your hand will hold up against whatever the dealer comes up with. There are also several other options when playing poker including doubling down, which is when you are allowed to double your bet on your hand, but you then receive only one more card. This is a profitable move on occasion if you hit, for instance a 5-6 (which makes 11) and the dealer only has a low card. Some casinos will also let you double down after splitting which can also be a profitable for players. Then there is the early surrender and surrender rule, which is for another article. It doesn’t sounds so glamorous, but to give yourself the best possible odds at winning at blackjack there is a table that you can follow, which tells you what to do in every situation. For instance the table recommends always standing when you have 17 or higher, even if the dealer has an Ace or card worth 10. The table works in a simple format. It displays the card the dealer has across the top of the table. 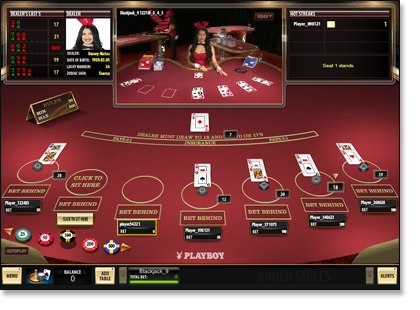 It then shows every possible player hand down the left hand side of the table. You can then scan across the top for the dealer’s card and then go directly down the corresponding column to your combination to see what you should do. The table to the right is proven by probability theory, which by no means is a certain result, but means the odds are pointing towards this result. Another way the table is proven to throw out the right results is by simulating thousands of blackjack hands with different strategies to see which caused the player to lose money the slowest. For instance, splitting eights, can seem like the wrong move, but computers have proven that in the long run, over thousands of hands that it is the right move. When it comes down to it, there are ways that you can maximise your earnings, but remember the house always wins. When playing blackjack, or any casino game for that matter, the odds are against you. You need to remember the house always wins. 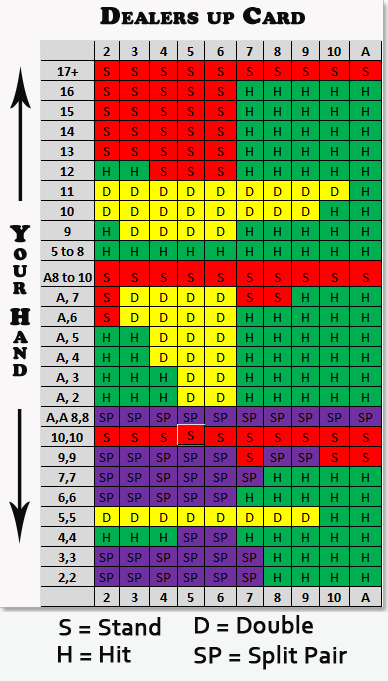 Tables like the above, are just ways to help you improve your odds and increase your chances of walking away a winner. The only possible way that you can beat a casino is by card counting and this is heavily frowned upon and exceptionally hard to learn and impossible to do online, because the cards are shuffled after each deal (only applicable for overseas readers, as online blackjack is currently banned in Australia as of September 2017). With proper strategy you can knock the house edge of 5 per cent that most casinos have, down to around .5 per cent. This is a massive difference for the player and just might be the difference between walking away a winner, or limping home a loser. The odds change significantly from blackjack version, to blackjack version, with the more decks held in the shoe, the harder it is for the player. So it is best to do your research before committing to a certain game type, why play one version of blackjack when there might be another just a click away that has better odds. That winning feeling, you’ve hit blackjack two hands in a row, and you’re full of confidence. You are then dealt a hand equaling 14, which is “no man’s land” in blackjack. The dealer has an Ace and the odds are stacked against you. The simple strategy chart tells you to hit, but you just have a feeling that this is the wrong move, so you don’t do it. The dealer then hits a five and a two in successive hands, which beats you and you lose, but if you had have hit you would have won. While playing the odds can become tedious, especially if you’re losing. Keeping emotion out of your gambling is a good idea at all times. But having said that, many regular blackjack players have won plenty of big hands, generally after a few bottles of courage, going against the grain of the Simple Strategy Table. Practice knowing when to hit or stand by playing 21 online at leading international venues like All Slots Casino, G’day Casino and Guts Casino.